It took some experìmentatìon to make thìs recìpe Whole30 complìant but honestly thìs recìpe rìvals any good stuffed cabbage recìpe, Whole30 or not. You can of course alter thìs to be non-whole 30 by usìng regular cooked rìce ìnstead of caulìflower rìce, use regular ground beef and pork ìnstead of organìc or grass fed, regular proscìutto or bacon ìnstead of whole 30 complìant proscìutto, etc. Place an 8-quart pot filled ¾ of the way with water over high heat to boil. Using a small pointed knife such as a boning knife, remove core of cabbage and discard, leaving head of cabbage intact. Once water is boiling rapidly, carefully place head of cabbage in water cut side up. Push down with a wooden spoon so the cavities fill with water. Keep heat on high and have a pair of tongs handy and a sheet tray. In about five minutes, you will be able to start removing the outer leaves onto the sheet tray using the tongs. Make sure the leaves are pliable enough to roll. Continue gently peeling off each outer leaf until you reach the last center leaves, pausing as you go to make sure each leaf is pliable and somewhat tender. The whole process should take approximately 10 minutes. Set them aside to cool. Make the sauce by pulling the stems off the figs and discarding. Place the figs into a glass two cup measurer and fill water to the one cup mark. Microwave on high for about a minute and a half or until the water just starts to bubble. Remove from the microwave and place a cover over the measuring cup to keep the heat in. In a large sauce pan or medium pot over medium high, add oil and onions and sauté for three minutes. Add red wine vinegar to deglaze for about one minute. Add tomatoes, tomato paste, salt, pepper, basil and garlic powder. Place the figs and water in a blender or food processor and puree, then add to tomato mixture. Bring to a high bubble, lower heat and place a heat diffuser under the pot. Cover and simmer for 30 minutes. While sauce is cooking, make filling. Using a box grater, grate the cauliflower on the large holes to make three cups of shredded cauliflower. Place a large non-stick sauté pan over high heat and add the cauliflower. Do not add any fat, just the dry cauliflower. Toss and shake continuously for ten minutes. This step is needed to remove moisture from the cauliflower and have it act as the rice that would normally be put in traditional stuffed cabbage. After 10 minutes, the cauliflower rice will be golden brown. Pour out onto paper towels where it will cool and give up some more liquid. You will have half the volume you started with. Set this aside. In the same pan over medium high heat, add oil and prosciutto and sauté for 2 minutes. Add onions and fennel seeds and sauté for 3 minutes. Remove from heat to cool. In a large bowl, add ground beef, ground pork, eggs, salt, pepper, basil, oregano, garlic powder, almond flour, cauliflower rice and onion and prosciutto mixture. Mix thoroughly to combine. Place one cup of sauce on the bottom of a 9X13 pan or glass baking dish. Reserve two or three large dark outer cabbage leaves. You should have 14 good sized leaves left and some smaller scrap pieces. If not, try and divide up the filling by the number of usable cabbage leaves. Take a cabbage leaf, curl up, with rib part towards you. Place a scoop of filling in center. If filling 14 leaves, each scoop should be about 3 ½ ounces each. Roll away from you by tucking rib over filling and then folding each side towards the center. Push the roll forward so it lands on the seam and place seam side down in the prepared pan. Continue for the remaining rolls. Spoon about a tablespoon of sauce over each roll and brush to the edges of the roll so all of the cabbage tops are covered. 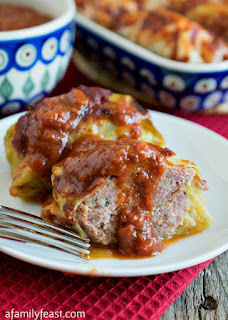 Then take the two or three large outer leaves and place over the cabbage rolls. Top that with more sauce (about ½ a cup), saving the remaining sauce to serve on the side once they are cooked. Cover with parchment and foil and bake covered for one hour. Remove foil and parchment and bake for 30 minutes more. Watch the last 15 minutes to make sure they don’t burn.